Honda is doing well for itself. To date this year the company is looking at sales figures showing nearly 10,000 more vehicles being sold in Canada than the previous year. In North America, Honda has more IIHS Top Safety Pick+ models than any other brand. There have been a plethora of industry awards Honda vehicles have picked up in 2013, none more so than residual value awards as consumers continue confirm that even as a pre-owned vehicle they’re willing to pay more for a Honda. So what’s the Honda secret formula? A focus on safety perhaps, or building well engineered vehicles, maybe it’s down to strong build quality stemming from stringent control of manufacturing processes. Experience with the company over the past few years has taught me that Honda places near infinite emphasis on these very traits; but success for Honda must surely come from its unfailing drive to build vehicles that please across a broad spectrum. It’s why you’ll likely never hear a Honda being described as deeply desirable or incredibly trendy. Seeing the production ready 2014 Accord Hybrid for the first time, I was actually a bit surprised to find that in an uncharacteristic move, this new Honda featured a decidedly trendy blue tint in the front and rear lamps along with a blue accented front grille. However, except for some ‘HYBRID’ badging, unique-to-hybrid wheels, and a rear air diffuser, the car is still very much the most recent iteration of conservative Accord that many have come to appreciate. As a colleague so eloquently put it ‘you date the crazy-exciting girl, but you make a commitment to the sensible one’. And despite the blue tints and accent, the 2014 Accord Hybrid is very much the sensible choice if you’re in the market for a mid-size sedan. The cornerstone of any hybrid is fuel efficiency; it’s the reason consumers pony up the extra cash to buy one. So what’s the 2014 Accord’s fuel efficiency like? In a word: surprising. Over a brief bout of dashing about country roads I managed a 4.8L/100km average in the span of an afternoon and 99km. 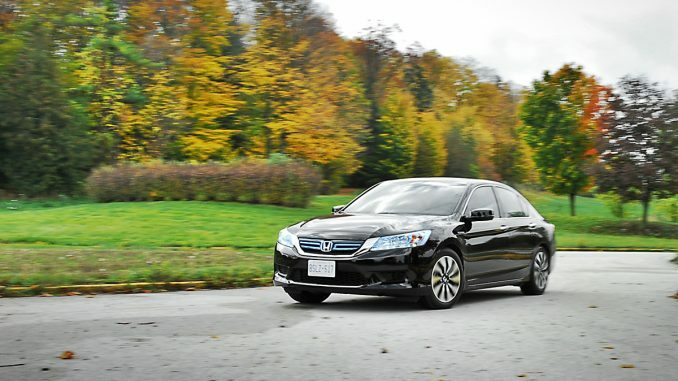 The official fuel economy numbers claim an average of 3.8L/100km making the 2014 Accord Hybrid the most fuel efficient mid-size sedan on the market today. The 2.0L DOHC iVTEC motor used in the Accord Hybrid is actually more efficient than any other 2.0L Honda motor. There’s even a slick regenerative braking system that combines a pedal feel simulator so that drivers still get braking feedback even when the car is entirely in power regen mode. Aiding the feel of spirited driving is a CVT that doesn’t intrude on driving feel by whining at all rpms. During my time with the car, I barely noticed that this Accord even had a CVT as it worked synergistically with the electric motors ensuring there was power on tap whenever I decided to throttle down. A hybrid that leverages the instant torque of electric motors to deliver a sportier driving feel? Honda’s got it right with this one. Inside, the Accord Hybrid boasts class leading cabin space along with an amalgamation of digital and analog instrumentation that just makes good sense. I rarely find myself disappointed by the layout and ease of use with Honda’s choice of cabin controls, and this time is no exception. Much of the Accord Hybrid interior is shared with the current generation Accord which debuted in 2013 —read our review of the 2013 Accord Coupe here. The 2014 Accord Hybrid starts at $29,590 and includes features like the Honda Lane Watch system, a rearview camera, power driver’s seat, dual-zone automatic climate control, keyless entry and push button start. Opt for the Accord Hybrid Touring model at $35,690 and buyers will be treated to Honda’s Forward Collision Warning system, Lane Departure Warning system, navigation, an upgraded 360-watt audio system, power sunroof, leather seating along with heated rear seats and a host of other convenience features. 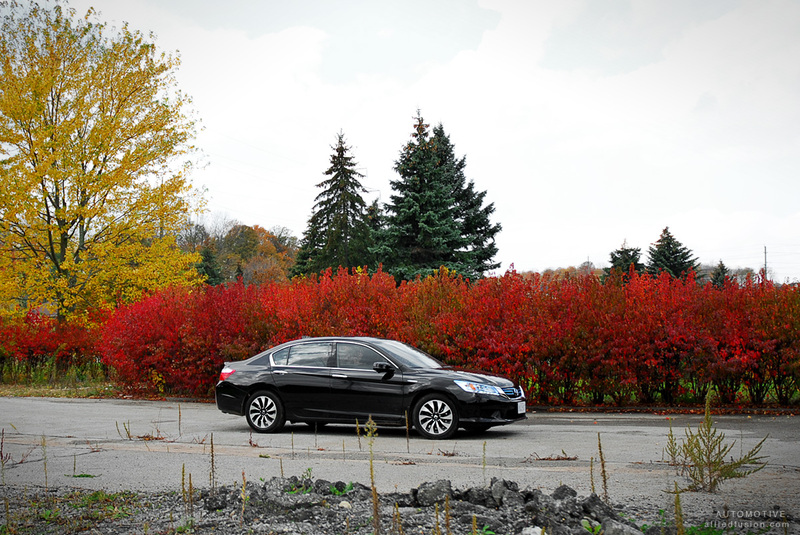 The built in Ohio Accord Hybrid goes on sale in Canada on October 31st.